Kelley has been an essential member of our office for 27+ years, and she loves the awesome team she works with every day. The joy she feels by helping others and bringing smiles to their faces is an amazing feeling! She is certified in X-rays and CPR. Kelley has a daughter Savannah and a son-in-law Parker. When she isn’t busy at the office, she enjoys working out, reading, being involved in the church, and spending time with family. Monkeys are her favorite animal! 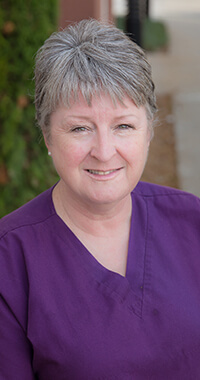 Elizabeth has been working in dentistry for an impressive 33+ years, and she first became a vital member of our team 31 years ago. 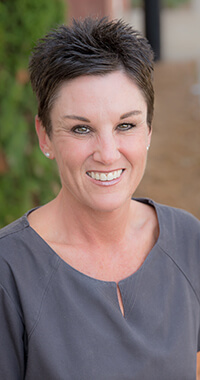 She earned her dental hygiene licensure from Clayton Junior College, and holds a Bachelor of Science in Psychology with a minor in Biology from Georgia State University. She is CPR certified and has undergone advanced training in periodontal therapy for treatment of gum disease and gingivitis. What she enjoys most about her work is loving on the patients and spoiling them silly! Elizabeth has resided in Fayetteville for 33 years, and she and her husband Richard have three special furbabies (cats) named Sabrina, Taz, and Dottie. When she has free time, she enjoys tent camping, antiquing, and traveling to North Carolina, where she and her husband plan to retire one day. In the past, she met 70’s heartthrob Bobby Sherman and even had her picture taken with him! 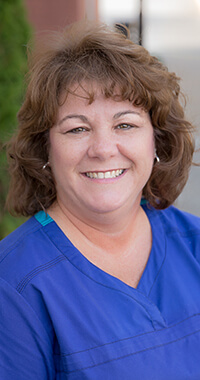 Tammy became a great new addition to our team three years ago, and she has 29 years of overall dental care experience. She received her dental assisting education from Penn Foster College and actually trained alongside her childhood dentist as a junior in high school! She loves caring for each patient and helping create so many beautiful, healthy smiles through her work. She is also certified in X-rays and CPR. Tammy is from Colbert. She and her husband of 22 years, Andy, have two children; Jake and Hadlee, and two dogs named Daisy and Lucy. When she isn’t at the office, Tammy enjoys spending time with family and friends, doing yard work, and camping. No matter what season it is, you’ll always find her sleeping with her socks on.